How do you choose your next work boot? It might seem like there are so many options out there. It’s true, there are a lot of brands and types of work boots to consider. However, certain work boots just have the reputation of being better than the rest. The bottom line is that if you are going to be on your feet all day for work and wearing boots, it’s worth spending the time and money for the right pair. There’s only so many hours in the day, so we sorted through lists of work boots to come up with the eight best work boots for you. Whether you need steel toe, alloy toe, composite toe, or soft toe work boots, one of these just might be the best work boot for you! Certain positions call for steel toe work boots and you might be wondering what steel toe cap boots even are. Well, these boots—also known as safety toe boots—are boots that feature a steel toe. These steel toes are incorporated stylishly into the boot to provide protection to your feet. They are typically used in construction and industrial settings and are the preferred type of hard toe boot. There are other options, alloy, and composite, but these can often snap instead of bending. This might not seem like a big deal, but when a couple hundred pound beam falls on your foot, you’ll be happy that you’re wearing a steel toe boot that didn’t snap when subjected to pressure. So, what are the top steel toe boots? Keep reading to find out! When it comes to steel toe work boots, the Keen Utility Men’s Pittsburgh Steel Toe Work Boot is one of the best on the market. This work boot is specifically designed for protecting your feet in mind. They offer what is called asymmetrical toe protection in which the toe caps are specifically formed for your right and left feet to protect everything from your big toe to your pinky toe. Other boots have the same plate in both shoes, but Keen takes it a step further. The toe box is also larger, which allows you to move comfortably all day without pinching and rubbing. 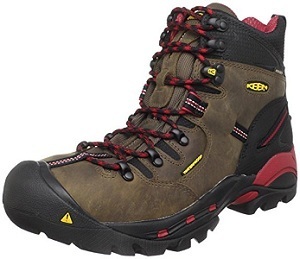 Keen does not just offer excellent toe protection, they also stress comfort when it comes to their boots. With a metatomical footed design, Keen’s internal support mechanism is engineered to offer great arch support that cradles your foot while offering both support and comfort. They also feature a snug fitting heel and roomier toe box for added comfort while you’re out and about all day working. They’re so comfortable that it will feel like you are wearing a hiking boot all day at work! That certainly beats the alternative of an ill-fitting, poorly constructed work boot. The Keen Utility Men’s Pittsburgh Steel Toe Work Boot also offers the perfect mix of breathability and waterproofing. The boot is constructed with a breathable membrane that is also waterproof. This means it lets vapor out to keep your feet cool and dry, but it also keeps moisture out. This is the perfect combination that not all work boots offer. When it comes to durability, the Keen Utility Men’s Pittsburgh Steel Toe Work Boot leaves nothing to be desired. This steel toe boot is built to last. You can rest assured that these work boots have everything you need. They are resistant to oil, slips, and abrasion, and even feature electrical hazard protection to keep you safe on the job site. The Keen Utility Men’s Pittsburgh Steel Toe Work Boot is a high quality work boot that is built to last. It is durable, waterproof and extremely comfortable. At just 2 pounds per boot, it’s also on the lighter side of steel toe boots. With Keen, you can’t go wrong. Built with comfort in mind, the Wolverine Men’s W02421 Raider Boots are a stylish boot that features a steel toe. These boots look great, but they also come with a variety of benefits. They with a Contour Welt design that is engineered with flexibility in mind. That means these boots will not only protect your toes, but they’ll also be comfortable to wear. In fact, Wolverine is so proud and assured of this work boot that they also offer a 30-day money back guarantee. You can wear these boots for 30 days and if you don’t like them you can return them for a full refund. That’s a great option, especially when you’re looking for a comfortable work boot to wear for at least 40 hours a week. Most companies do not offer this, so if you’re even remotely interested in the Wolverine Men’s W02421 Raider Boot, you can test them out without going all in. The great thing about the Wolverine Men’s W02421 Raider Boot is that they are designed to move with you. This flexibility makes them especially comfortable for people on the move all day. If you are climbing ladders or crawling in an out of construction equipment all day, you’ll be glad to have these comfortable boots. They come with a full-cushion Wolverine Multishox® insole that is removable and provides all-day comfort and support that is unparalleled. 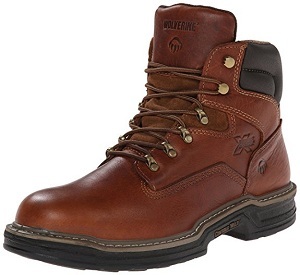 If you are looking for comfortable work boots, the Wolverine Men’s W02421 Raider Boot is definitely a steel toe boot to consider. They are also durable and rated highly when it comes to safety. The steel toe obviously meets ANSI/ASTM safety requirements, but the safety features don’t stop there. This boot also has a rubber outsole that provides a reliable grip. They are slip, oil, and abrasion-resistant no matter how slick the surface you are working on. With names like Wolverine and Raider in the name of this boot, you think it would be rugged and tough. 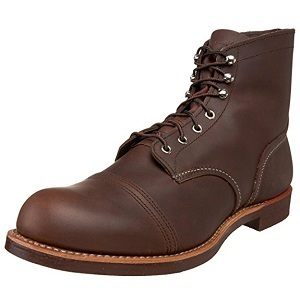 The Wolverine Men’s W02421 Raider Boots are, but they’re also comfortable. That’s a hard combination to find in work boots. Caterpillar might be best known for their rugged construction equipment, but they also manufacture quality work boots as well. The Caterpillar Men’s 2nd Shift 6” Steel Toe Boots are a good combination of durability and comfort. These sleek black boots have a 6” shaft from heel to arch and are constructed from durable leather that is built to last. These boots were designed with safety in mind. They feature a steel tool rated ASTM F2413-11 I/75 C/75 and are also electrical hazard resistant, slip resistant, and oil resistant. No matter what type of work you are doing, the Caterpillar Men’s 2nd Shift 6” Steel Toe Boots will keep you safe and sound throughout your shift. The great thing about the Caterpillar Men’s 2nd Shift 6” Steel Toe Boots, is that they are also very comfortable to wear. They feature a round toe design that allows more room for your toes to keep them from feeling squished. They also come with a Climasphere sock liner that is able to regulate the temperature. This means during colder weather your feet are kept warm and during the hot months, your feet will be kept cool. There’s also a nylon mesh liner that wicks moisture away to keep your feet dry. They are not waterproof, but a water resistant coating can help with that. Overall, the Caterpillar Men’s 2nd Shift 6” Steel Toe Boots are a great option for all types of work. They’re good for heavy construction, engineers needing protection on the job site, and even steel workers. These boots truly are built to last with full grain leather uppers and durable eyelets and hooks. It’s made with Goodyear welt construction so you can rest assured that the Caterpillar Men’s 2nd Shift 6” Steel Toe Boots will last you for many shifts to come. The Sketchers Men’s Verdict Waterproof Boot is another steel toe boot to consider when you are looking for the perfect work boot. These boots come in three different colors, black, brown, and wheat. Whatever option you choose, they are pretty stylish and feature a nice oiled leather exterior. The great thing about the leather design is that it makes the boots waterproof. You can wear these out in the elements, splashing through puddles, and your feet will stay dry. These boots are also built to last with side reinforced stitched sealed seams and a seam-sealed waterproof midsole. They feature a six eyelet lace up front with hexagonal eyelets for added style. In addition, there’s a padded collar and tongue for added comfort. This might not seem like much, but when you’re wearing these boots for over 40 hours a week, you’ll appreciate any bit of comfort that you can get. There’s even a cushioned insole that will give your soles a bit more support. In addition, these boots feature a steel shank in the midsole for added stability and comfort. The rubber traction outsole also keeps you upright because it’s slip resistant. While the steel toe keeps your feet—toes in particular—safe from falling objects, the insoles and outsoles will keep you stabilized and safe from punctures from below. Where Sketchers really stands out against the competition, is when the price comes into play. 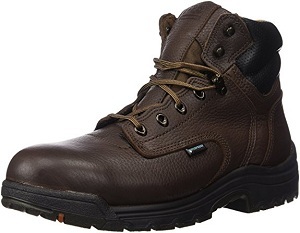 They might not have the most brand prestige, but if you are looking for comfortable steel toe work boots, the Sketchers Men’s Verdict Waterproof Boots provide a budget-friendly option. One thing to keep in mind with these Sketchers boots is that they run a bit small. If you are looking to purchase a pair, you might want to buy a size larger than you normally wear. Sketchers might not be a brand name that pops into your head when you think of steel toe work boots, but the Sketchers Men’s Verdict Waterproof Boot might surprise you. This affordable work boot will keep your feet dry and keep you going all day long. When it comes to safety shoes, alloy toe cap boots are another favorite. What makes alloy toe boots different than the other types? Well, alloy toes are made from more lightweight materials. They are typically mixed and can range from silicon, iron, chromium, titanium, copper, zinc, and even aluminum. What makes them the preferred type of safety shoe for some work boot wearers, is that they are much more lightweight than steel toe boots. Steel toe boots are made from just that—steel—and they can be very heavy. Instead of lugging around an extra pound or two on each foot all day, alloy toe boots provide almost as much protection, for a lot less weight. Perhaps the most well-known when it comes to work boots, Timberland offers a great alloy toe cap work boot. 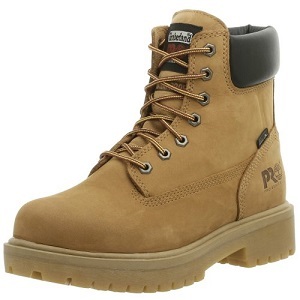 Their Timberland PRO Men’s 26078 Titan 6″ Waterproof Safety-Toe Work Boot is the perfect mix of durability and comfort. You know these boots are quality because they’ve been around for over thirty years and are still one of the top work boots on the market! One of the best features these boots deliver is the comfort. Every pair of Timberland PRO Men’s 26078 Titan 6″ Waterproof Safety-Toe Work Boots comes with Power Fit Comfort System, proprietary to Timberland. This system enables the boot to provide maximum support throughout the key areas of your feet, while also offering unmatched comfort. The great thing about Timberlands is that there is no “break-in period” with their boots. You can pop them on and head off the work on the day they arrive without worrying about blisters or wearing. The Timberland PRO Men’s 26078 Titan 6″ Waterproof Safety-Toe Work Boots feature an aluminum alloy safety toe. This is half the weight of a steel toe with the same level of protection. When it comes to safety features, these boots also have a slip, oil, and abrasion resistant sole. With a waterproof leather upper, your feet will also stay nice and dry during a long day of work. No matter what your work environment is, you’ll be protected from whatever comes your way. Another benefit of these Timberlands is that they also come with a thirty-day money back guarantee. You can wear these boots as often as you want during that initial trial period and if you do not like them for any reason, you can return them for a full refund. This is great when you’re looking for a pair of comfortable work boots, even if there’s no way you’d ever consider returning them. Timberland is a well-known work boot brand and the Timberland PRO Men’s 26078 Titan 6″ Waterproof Safety-Toe Work Boot is one of their best. This boot requires no break in period and is built with both safety and comfort in mind. Plus, there’s no risk. With a 30-day money back guarantee, if you don’t like them you can easily return them. Last, but not least, if you are considering safety shoes, composite toe work boots are another option. These boots are newer to the market and have toes comprised of non-metallic materials like plastic, fiberglass, Kevlar, and other elements. The reason these work boots are gaining popularity is that there is no metal in them. This makes people who work in areas with electrical hazards very happy because it decreases the risk of electrocution. In addition, composite toe work boots, like alloy toe work boots, are also much lighter than steel toe work boots. These boots also do not conduct heat or cold. The combination of these benefits makes composite toe boots some of the most comfortable boots on the market. Carhartt is known for making quality outdoor apparel and they do not disappoint with their Carhartt Men’s CMF6366 6 Inch Composite Toe Boot. They’ve been in the business since 1889 and that has enabled them to perfect this composite toe work boot. In addition, these boots can frequently come in under $100, which makes them insanely affordable for the amazing benefits they offer. The Carhartt Men’s CMF6366 6 Inch Composite Toe Boot provides superior safety features while offering the comfort of a hiking boot. There isn’t even a break in period with these boots. Though they get more comfortable after wearing them for a few days, these boots start off comfortable. They feature a padded tongue and collar that doesn’t wear or rub. What really makes Carhatt stand out, is the insole. This insole is thicker than other boots at the same or even high price points offer, and it’s removable. Made of ortholite and polythurene, the insole rests on a quality EVA midsole. This enables the boot to have increased shock absorption, which is great if you are on your feet all day. In addition, the Carhartt Men’s CMF6366 6 Inch Composite Toe Boot features a steel shank that will keep you stable on even the rockiest terrain. 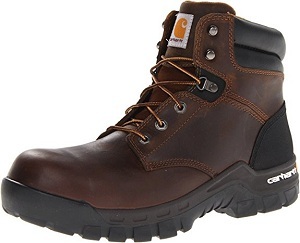 When it comes to safety, the Carhartt Men’s CMF6366 6 Inch Composite Toe Boot also delivers. This composite safety toe will keep your toes protected and the boots also have electrical hazard protection. In fact, these boots meet both the ASTM F2413 Electrical Hazard Standard and ASTM F2413 protective toe classification. With a deeply grooved outer sole, you’ll also benefit from slip, oil, and chemical resistance. If you work around water, these boots are water resistant, but not waterproof. If you’re constantly working in wet conditions these might not be a great fit, but they do repel small amounts of water and rain. Carhartt might be best known for their jackets and hats, but this boot delivers. The Carhartt Men’s CMF6366 6 Inch Composite Toe Boot is the perfect mix of comfort, durability, and safety, which is why it made our list of top composite work boots. They’re lightweight, comfortable, and meet all the necessary safety requirements. What else do you need? For the uniformed personnel, Bates may be a popular brand name. For over 10 years, Bates has been delivering quality work boots and the Bates Mens Ultra-Lites 8 Inches Tactical Sport Side-Zip Boot does not stray from this fact. These are some of the most popular Bates boots and they offer a mix of safety and comfort. 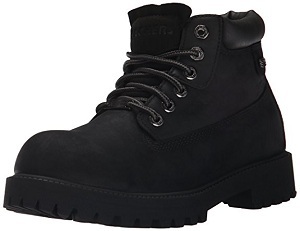 First off, these stylish black tactical boots feature an 8” height which is great for increased ankle support. They are made from a durable leather and have a comfortable nylon upper. The upper is actually constructed of 1,680 denier ballistic nylon, which means they are built to last. Perhaps one of the best features of the Bates Mens Ultra-Lites 8 Inches Tactical Sport Side-Zip Boot is the mesh lining that is both breathable and comfortable. If you are moving about all day, this mesh lining will help keep your feet cool, which makes you more comfortable in the long run. In addition, the side zipper makes it easy to slip these boots on and off. If you’re frequently required by your work to suit up and go at a moment’s notice, these boots will certainly come in handy. There’s also a removable and replaceable insole that makes it easy to clean or slip a new one in for added comfort and support. Their athletic construction makes it easy to move around in and if you’re frequently on the move for work, these boots are a godsend. They’re also lighter than most other work boots, which means less drag while you’re moving about and working. 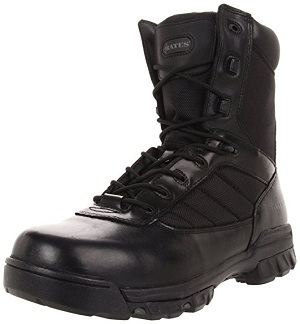 Bates Mens Ultra-Lites 8 Inches Tactical Sport Side-Zip Boots also deliver from a safety perspective. These boots are non-metallic, meaning they are undetectable in electronic security environments. For law enforcement, this is a huge plus an it it considered an excellent tactical boot. They are also slip resistant and passed the SATRA WTM 144 test for slip resistance. When it comes to your safety at work, the Bates Mens Ultra-Lites 8 Inches Tactical Sport Side-Zip Boots allows you to be safe and comfortable. 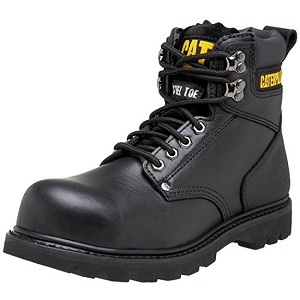 Whether you’re chasing bad guys or delivering mail, Bates delivers a quality, affordable work boot that you will love. Sometimes you don’t need a hard protective toe, but you still need a quality work boot. These boots do not feature a hard toe cap like steel, alloy or composite toe work boots, but they still offer a variety of benefits. First, soft toe boots can protect you from hazards aside from falling objects, like electrocution and slips. Those looking for waterproof shoe options also turn to soft toe work boots to keep their feet dry and comfortable all day. Soft toe work boots are often the lightest of the four types of work boots and if you don’t need a hard protective toe for your line of work, they are typically the favored option. If looks were the only thing to be considered, the Red Wing Men’s Iron Ranger 6″ Boot would be the best soft toe work boot hands down. Based on the mid-century iron miners from the Midwest, this gorgeous boot is sleek and built to last. They are constructed of oil tanned leather that is resistant to water, stain, and perspiration. These work boots are stylish enough that they could even be mistaken for a casual boot worn with jeans in a normal setting. This is a nice feature, especially if you’re frequently heading from the job site to meet with clients or going out for other social gatherings right after work. The versatility is not something that other, chunkier work boots can offer. While these boots look stylish, that isn’t all they offer. These boots are stitched together with triple stitched waxed threads, which means they won’t be falling apart on you anytime soon. The cork insole might take a few days to break in, but this a more expensive material than most other work boots have, which means it will last years and years. That is something most other work boots simply cannot deliver at their price point. While these boots don’t have the best track record when it comes to winter wear due to their treadles cork nitrile outsole, this rugged 6” boot delivers unparalleled comfort. With a double layer leather toe cap, leather heel pocket, and nitrile cork outsole, you will be hard-pressed to find in any other work boot. For someone who is on their feet all day, the superior comfort that the Red Wing Men’s Iron Ranger 6″ Boot provides will be welcomed with open arms. Red Wing is committed to delivering quality footwear and they certainly deliver with the Red Wing Men’s Iron Ranger 6″ Boot. While these boots are on the higher end of the pricing spectrum, they’re comfortable, versatile, and stylish. You won’t regret this purchase when you don’t have to buy another work boot for years to come! Thorogood is not a brand name that you might recognize as well as Timberland, but they have been making boots for over 100 years. Since 1892, Weinbrenner Shoe Co. has been manufacturing the Thorogood Men’s American Heritage 6″ MAXwear Wedge Non-Safety Moc Toe Boot and the boots have risen in popularity for a reason—they’re a fantastic work boot. 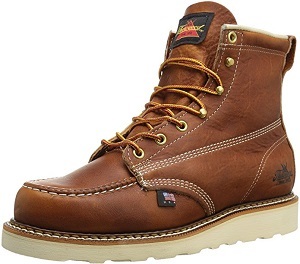 This model of the Thorogood Men’s American Heritage work boots is a non-safety toe model, but this boot also comes with the option of a safety toe. Made right in America—Wisconsin to be exact—these boots are great for anyone who spends the majority of the day on their feet. These boots have a white, max wear wedge sole that is stylish but also delivers by doubling as non-marking and slip resistant. The outsole will never separate from the upper, which is constructed from tobacco gladiator oil-tanned leather. The Goodyear Welt construction guarantees this. Once you slip these boots on, you’ll immediately realize why they are regarded as one of the most comfortable work boots. The Thorogood Men’s American Heritage 6″ MAXwear Wedge Non-Safety Moc Toe Boots feature a removable cotton liner that keeps the inside of the boot both odor and moisture free. They also come with the Dual Density Ultimate Shock Absorption insole that only Thorogood boots offer. With a composite shank, you’ll also be sturdy on your feet in even the rockiest of terrain. You won’t lose the comfort factor, though, as these beets have a comfort-cushion foot bed and comfortable rubber midsole. This is important to make note of because these soles are designed to absorb shock from your steps and resupply it to you. That means when you step, the soles absorb the energy and then released when you lift your foot so every step comes with a bit of a spring. This energy saver might not seem like much but will make those long days on the work site just a little bit easier. When it comes to comfortable, supportive work boots for an affordable price, the Thorogood Men’s American Heritage 6″ MAXwear Wedge Non-Safety Moc Toe Boot are a great option. You no longer have to choose between comfort and affordability because with Thorogood you can have both! If you are looking for a budget friendly pair of work boots, the EVER BOOTS Tank Men’s Soft Toe Oil Full Grain Leather Insulated Work Boots are a great option. These boots are great, especially for winter months or cold weather locations. The boots feature a 7” shaft and a quality, durable Goodyear Welt construction so they are built to last. These are soft toe boots that are great for any work environment that doesn’t require a hard toe cap for protection. When it comes to safety features, these boots have oil-resistant qualities and the rubber outsole is also slip resistant. That means you never have to worry about your safety on the work site. What’s great about the EVER BOOTS Tank Men’s Soft Toe Oil Full Grain Leather Insulated Work Boots is that they are built to last. They feature leather uppers and a sturdy Goodyear welt construction for durability. They even come with a 3 month warranty so if anything happens, you can exchange them for a new pair. The EVER BOOTS Tank Men’s Soft Toe Oil Full Grain Leather Insulated Work Boots also feature an anti-fatigue component. The arch of the boot is supported by a steel shank that absorbs pressure when you are climbing about the work site. They are comfortable to wear with cushioned insoles, so they’ll keep you moving comfortably all day long. Although the EVER BOOTS Tank Men’s Soft Toe Oil Full Grain Leather Insulated Work Boots might look like a generic pair of work boots, they offer durability and comfort for a low price. If you are looking for a pair of soft toe work boots that will keep your feet warm and dry, and keep you from slipping in slick conditions, the EVER BOOTS Tank Men’s Soft Toe Oil Full Grain Leather Insulated Work Boots are the boots for you. When it comes to working boots, Timberland is one of the most popular and reputable brands. The company offers a variety of work boots, and the Timberland PRO Men’s Direct Attach Six-Inch Soft-Toe Boots are a great option if you don’t need a hard capped boot. The Timberland PRO Direct Attach work boots are a versatile, all-purpose work boot. They feature a rugged rubber outsole that provides traction and keeps you from slipping. These boots are also constructed with seam-sealed waterproof leather uppers. This design element keeps your feet dry even when the boots are submerged in water. They also come with electrical hazard protection so you don’t have to worry if you’re working around electricians or electrical equipment. In addition, the Timberland PRO Men’s Direct Attach Six-Inch Soft-Toe Boots also feature a PRO 24/7 comfort system that is designed to support your arch and keep your foot from getting fatigued. Even in the most strenuous working environments, these boots will keep your feet from becoming pained. While the Timberland PRO Men’s Direct Attach Six-Inch Soft-Toe Boots are durable and safe, they are also extremely comfortable. These work boots have a padded top collar that provides long-lasting comfort. There is also a mesh lining that has been given an anti-microbial treatment to reduce odors and keep your feet comfortable and dry during even the longest days on the job site. 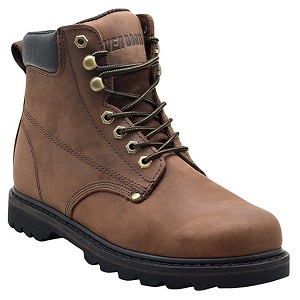 Timberland is a great brand of work boots and the company does not disappoint with their Timberland PRO Men’s Direct Attach Six-Inch Soft-Toe Boots. These boots are stylish and durable and will keep you moving all day without pain or discomfort in your feet. If you need a soft toe work boot, the Timberland PRO Men’s Direct Attach Six-Inch Soft-Toe Boots should definitely be on your short list for consideration. 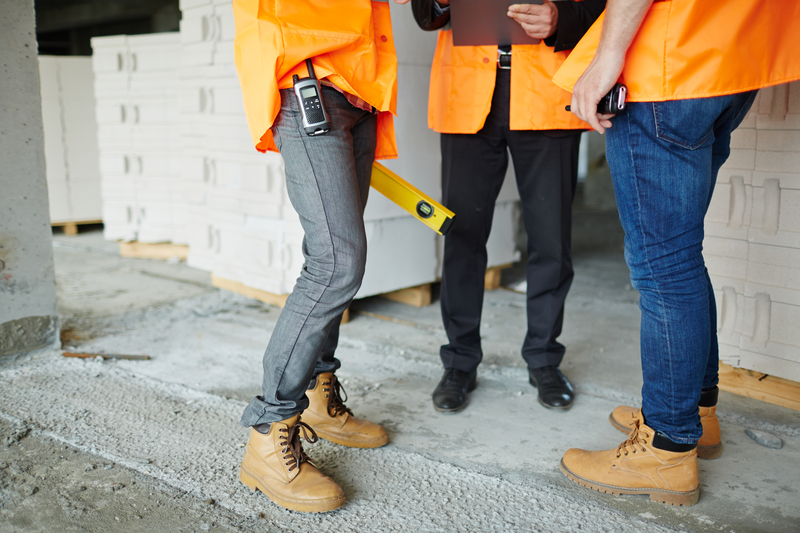 There are so many different types of work boots on the market and it can be difficult to find the best type of boot for you. There are many specs to consider, like toe type, safety rating, weight, and more. This guide breaks down the top features to consider when selecting a work boot so you can choose the one that is the perfect fit for you. Type of Toe: The type of toe that you want comes down to necessity and preference. Some jobs require a certain type of safety toe, others just require that you have safety shoes—like steel, composite or alloy toed boots. However, if you don’t require safety toes, opt for soft toe boots because they are lighter and often more comfortable. Heel & Sole Types: Much consideration is placed on the type of safety toe your boot features, but you also need to consider what the heel and sole are made of to keep you safe from slips and punctures from below. That is why no matter your boot has for a toe, you should also look for boots that are slip resistant and puncture proof. Comfort: Perhaps the most important element of work boots, aside from their safety rating, is how comfortable they are. These are boots you will be wearing for at least 8 hours a day, 5 days a week. You want to be sure that they fit well and are comfortable. If not, you’ll be dreading putting them on and going to work every day. Be sure to try boots out and walk around your home and if they feel too big, or rub somewhere, return them and get a more comfortable pair! Weight: When you’re wearing work boots all day, even a pound per boot can make a big difference. When you’re moving around all day, climbing structures or walking long distances, the lighter your boots, the better. Electrical Hazzard Protection: If you work around electricians or electrical equipment, you will want boots that feature an electric hazard rating and fortification. These boots contain no metal elements, which will keep you from becoming part of the circuit and getting electrocuted. Durability: Durability is something else to keep in mind when buying a work boot, especially if you are paying a lot. Double check the boot structure for quality materials and durable construction like double and triple stitching. When you are paying for a quality boot, it should last. Waterproofing: Are you working outdoors often? Do you come into contact with streams, lakes, or other bodies of water? If so, you’ll want a work boo that is waterproof. There might not be anything more frustrating than dealing with wet feet your entire day and a waterproof boot can help combat that. Price: People often say you can’t put a price on safety or comfort, but sometimes you have a budget to stick to. When purchasing a work boot, be sure to consider your budget. Get a general price idea in mind and look for work boots that meet your main safety and comfort criteria that don’t break the bank.